OMG! One of my absolute favorite brands is back... Champs! It's probably not everyone's cup of tea, but Champs is one of those odd products that puts everything into it, maybe even the kitchen sink! 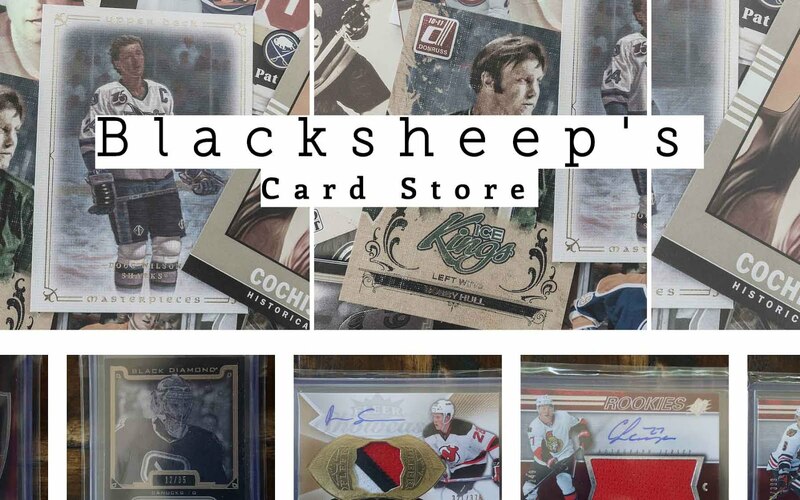 The main focus of Champs is of course hockey, but Upper Deck has also thrown in all sorts of non-hockey related cards as well. This appeals to some and not so much to others. 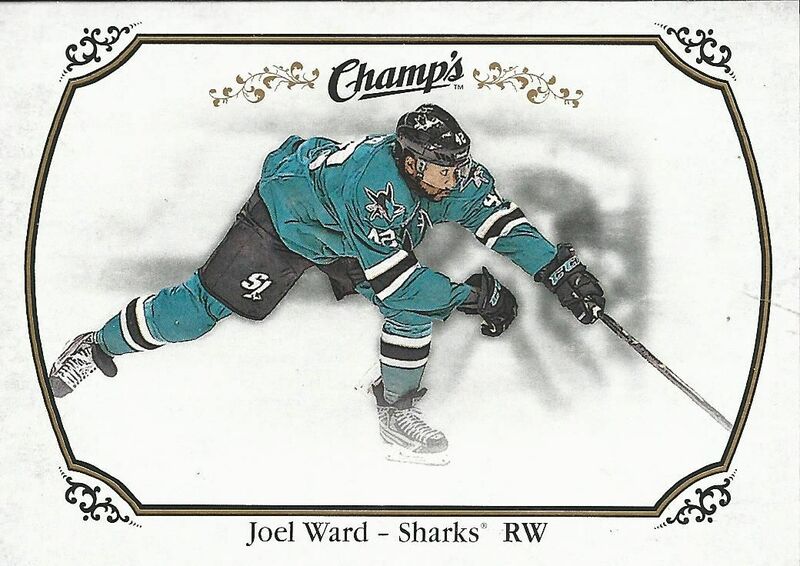 But I think all can agree that Champs is unlike anything else in the realm of hockey cards. The Champs brand is a throwback to the old days of collecting. No, not hockey card collecting necessarily, but baseball cards of yesteryear. Products like Champs have been released by Upper Deck and Topps, and they both try to appeal to the unique flair that really old time cards had. These cards aren't glossy or modern. In fact, they have that older cardboard feel with the brown cardboard back - similar to what O-Pee-Chee has. 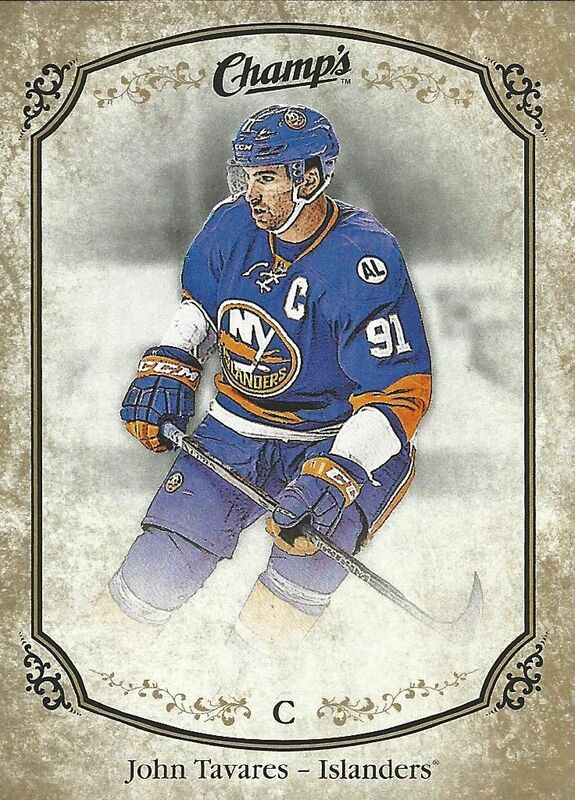 It's a great feeling to have on a card, and I love that Champs has joined OPC in giving collectors the opportunity to have this older style of hockey card to collect. Unlike OPC, these cards have an even more retro look to them. Rather than being more colorful, these cards focus on simplicity and elegance. The simplicity of these cards is what makes them real winners in my book. I just love the way these cards have been designed. It's a great way to have Champs come back! 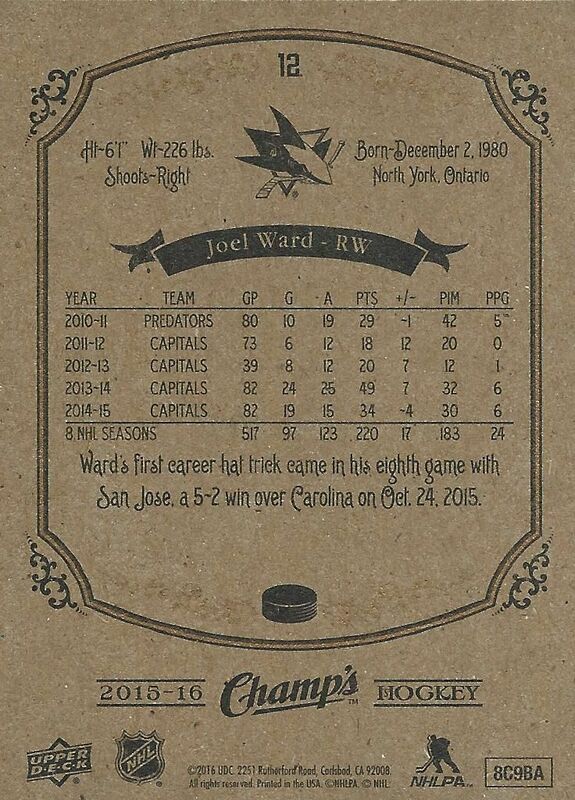 As I mentioned, the back of the card is cardboard brown, and that's an awesome thing to see. Backs have some stats from past seasons as well as a very short write-up. I think Upper Deck could have gone even simpler to mimic more what older cards were like, but they have brought in more modern card elements to the backs. That's definitely ok, but I think detracts from the old style feeling just a little. Rookie cards don't get too much to distinguish them from the rest of the base cards. In fact, as I was going through my packs, I missed quite a few rookies because I didn't see the rookie designation at first. All the rookie cards get is a little black banner above their name and position on the card. Other than that they look pretty much exactly the same. Some cards in the main set of Champs are short printed. These cards come at the end of the set and are referred to as the hi-numbered cards. Back in the old days, the cards at the end of the big baseball sets were often printed in smaller amounts. Champs has replicated this with their release. I've noticed that many star players have been short-printed as well as some of the bigger rookies. The McDavid I pulled was a short print. 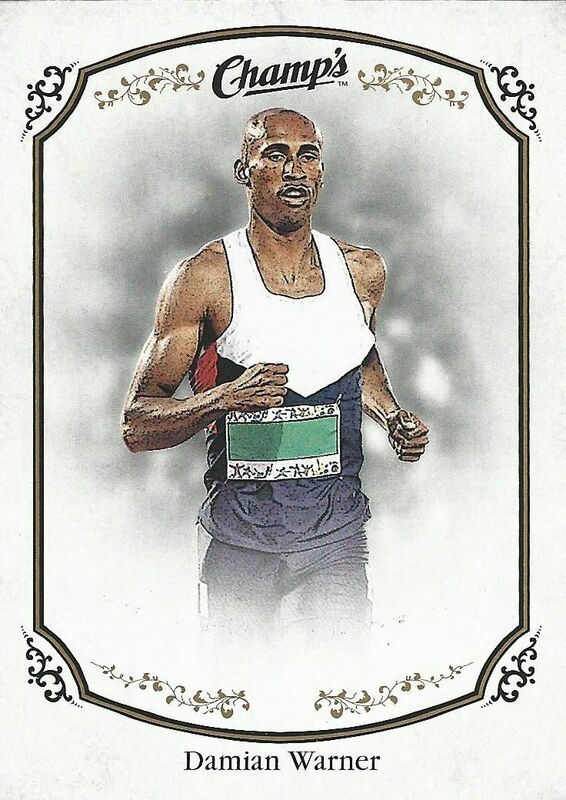 Non-hockey players that are found in the set such as this Damian Warner are also cards that are included in this more limited print run. Upper Deck guarantees you three hits per box of Champs. One of the hits should be an on-card autograph while the others are memorabilia. Also in boxes should be insert cards and parallels. 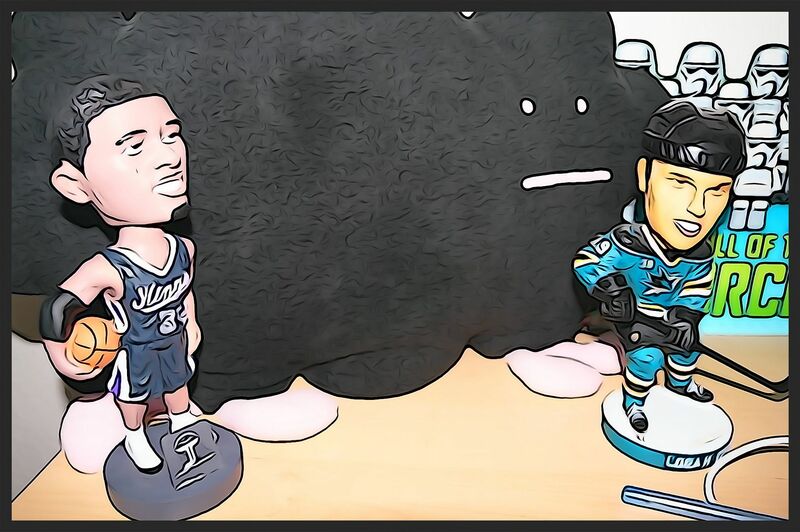 If you're lucky, you can also find strange items that you would never really expect to get from a box of hockey cards! Upper Deck seems to have an obsession with animal and creatures when it comes to sets like this so it doesn't surprise me to find fish as one of the main insert sets in Champs. In fact, they apparently think it's so good that they feature the set on the front of the box as a draw. I'm not particularly excited about these cards, but I'm sure there will be some who do like it. Like everyone practically, I love eating. I'm just not sure if I like pulling food cards from my packs. I do have a soft spot for pizza though so this card was kind of cool for me. Luckily, the set isn't full of these kinds of cards and getting them once every-so-often can be pretty funny. 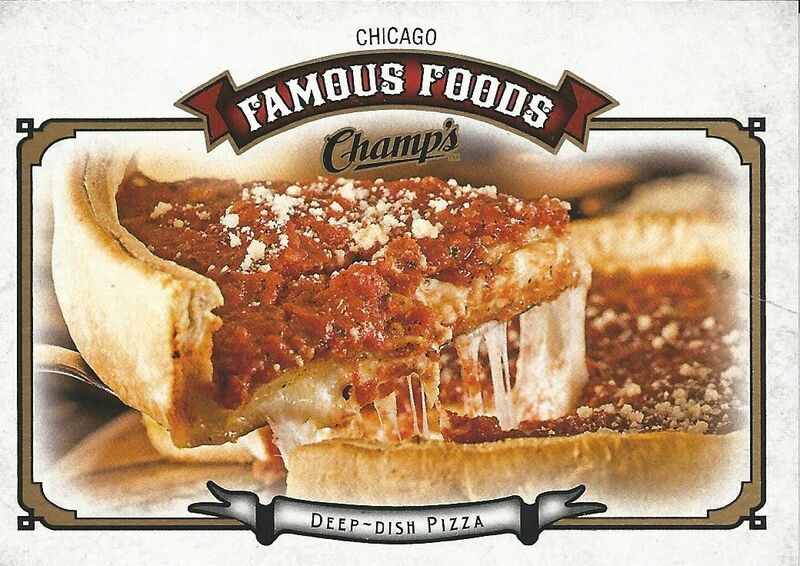 The deep dish in the photo does look rather good. 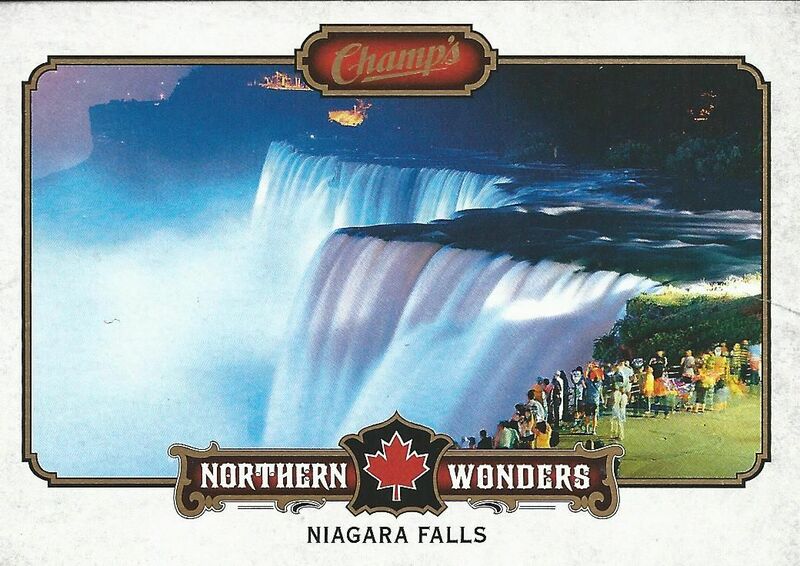 Cards featuring famous landmarks are also nothing new to Champs. 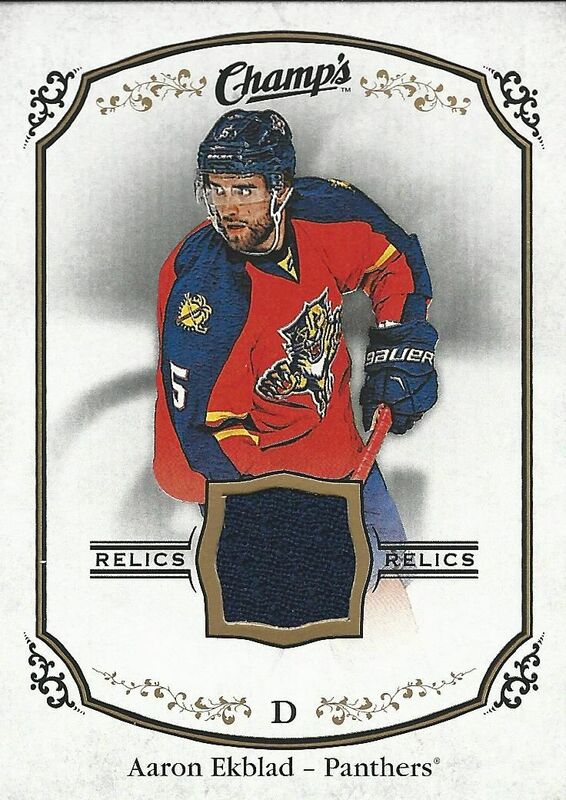 Again, it's probably not a card you're really wanting out of a box of hockey cards, but a few per box isn't going to hurt anyone. I suppose some may enjoy these Northern Wonders as they depict some pretty awe-inspiring places. Parallel cards can be found in abundance in Champs, though perhaps not at the insane levels they once were found at. In the past there were many, many colors that collectors could look for. Some of the parallels were downright impossible to find. It looks like Upper Deck has toned down the amount of parallels with this release. 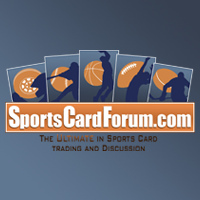 The most common parallels are these gold bordered cards. Some cards will have alternate backs with a Champs logo rather than the standard back. Silver bordered parallels are more difficult to find and are much more limited in nature. Each silver parallel has serial numbering to 25 on the back of the card. The silver stamped numbering on the back looks cool on the brown cardboard backing. My box produced exactly what the front of the box stated. Both of my memorabilia cards were jersey hits - one rookie and one veteran. These relic cards feature a small swatch of jersey on the standard base card. It's a nice look, but nothing that would blow you away. Still, this is a very classy and clean way to do jersey inserts. 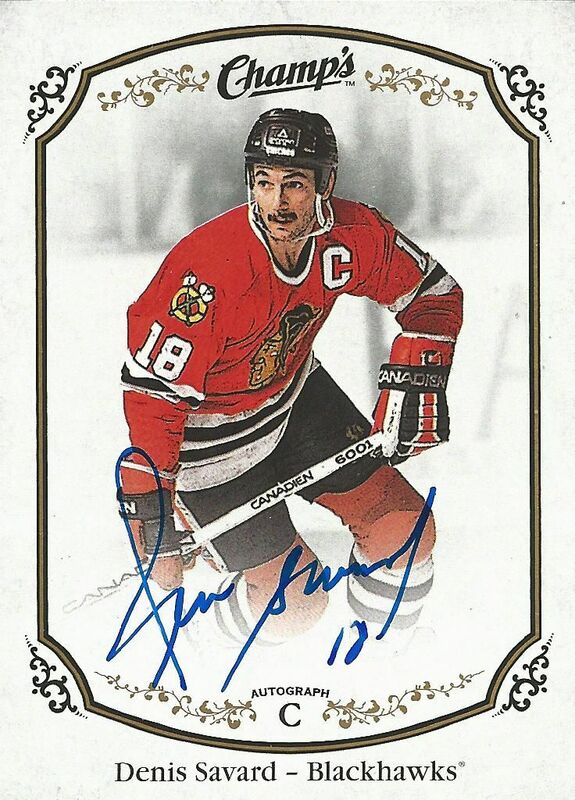 I was very pleased to pull Denis Savard for my on-card autograph card. He's a legendary player and the blue ink of the autograph looks really great on the white background of the card. These autographs look really sweet and I'm sure they will be popular amongst collectors this year. Many of the bigger name players are very tough pulls, so they should command a good amount of value on the secondary market. My box of Champs was pretty standard, but this set of cards is anything but. They may be difficult to pull, but collectors are in for a huge treat when opening up boxes of Champs. I'm not even going to mince words... I love Champs! I am so glad that it is back! Champs offers collectors a product that is unlike anything else out there. And it comes at a price that is pretty reasonable compared most other products that are available. Boxes go for around $100 a pop. 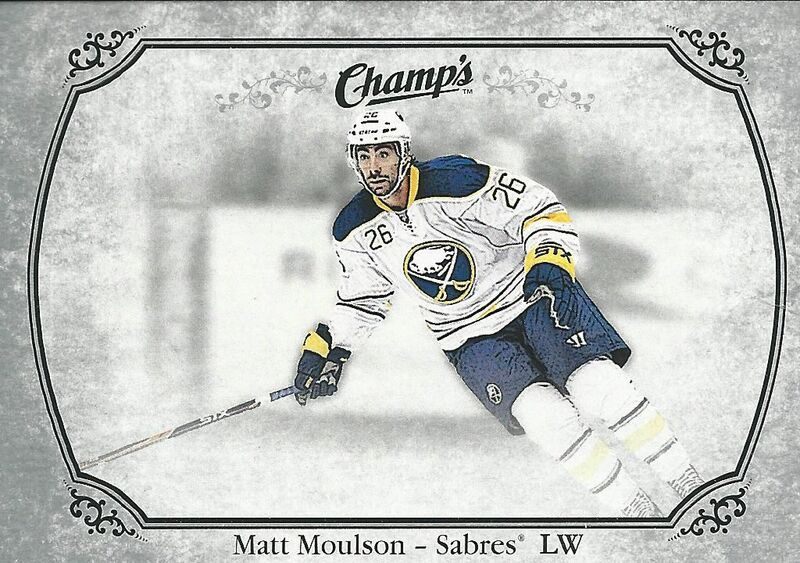 I really hope Upper Deck releases Champs at the retail level for collectors to get more of the product. I would totally be on board for getting blasters of this stuff. 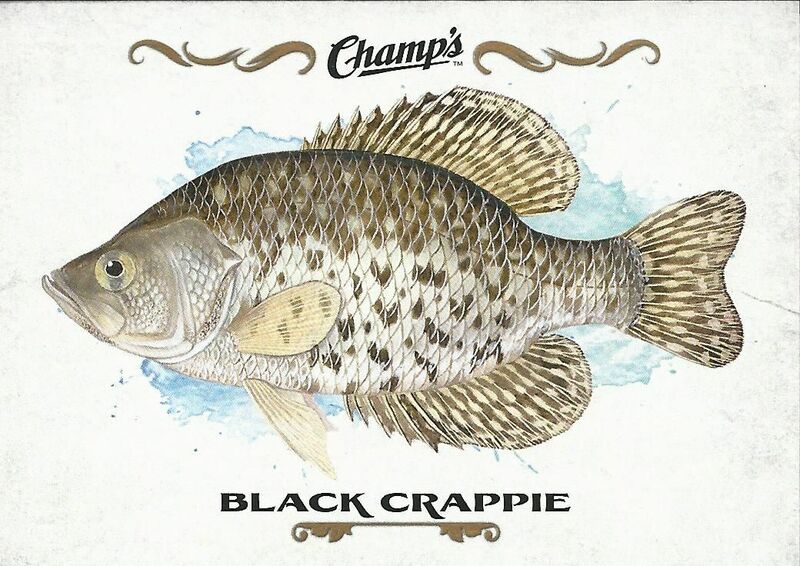 I recommend Champs very highly and would love to get more of this product in the very near future as it is contains some awesome things to find for both collectors on a budget and collectors who have a good deal to spend in the hobby. There really is something for everyone here. Really enjoyed your review Luke! I really love the new camera angle too! I think that the base cards and jersey/autos are very clean looking. The set is definitely a different one. I like the clean design of the card (like SPA), and agree that the fish / pizza / Falls are rather... interesting. Nice McDavid. This set is totally different. I was laughing due to the fish cards and random inserts lol. Always enjoy your breaks! Nice product. Base set looks great and you get plenty of rookies and inserts. I might grab a few packs when I go to my LCS. Nice Denis Savard auto! I really like the inserts, their very unique! The set looks pretty good. Awesome Savard auto!!! I think that Champs is awesome and I am also happy that it is back! I just wish, like you stated, that in the near future should release blasters or retail boxes. Seeing as I don't have a lot of extra money to be spending, $100 for a hockey box is quite expensive for me. But if I were to do that I would enjoy it and most definitely recommend and want to open more. Thanks for your awesome review and video!! 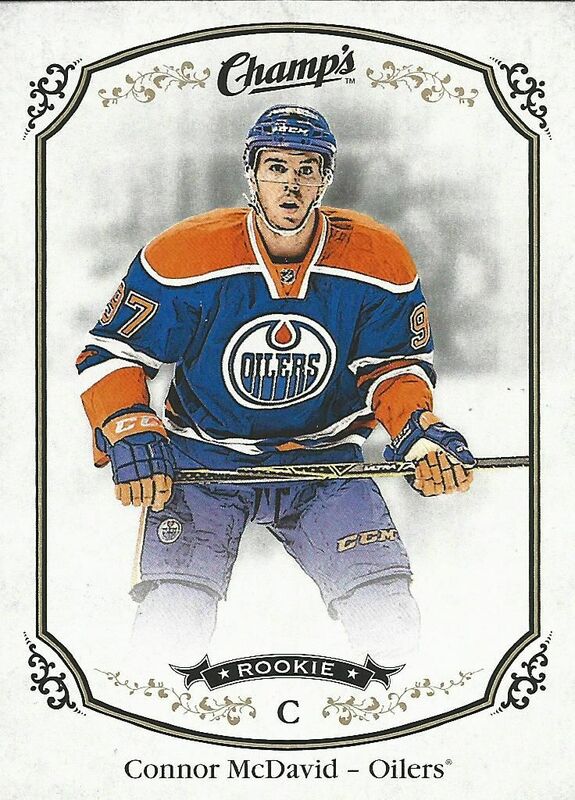 That McDavid rookie looks so good. I have never really seen anyone open champs before. Ive never been interested in the brand but I decided to give to give 15-16 a chance. Overall it is a nice brand with beautiful cards but it is a little weird which I like because it is different than all the other brands. May just have to pick up a box. Great video and review! Great review, I really like the look of this years Champs. I love the variety that comes in these packs. Learning about fish species can be very interesting! Very nice mid-end product by upper deck. I would love to pull an artifact card of a metorer, Etc. Never opened any Champs, might have to pick some up! This is really unique and the Savard autograph is great!! Glad UD Champs is back! Seems like a fun product to open. those were really nice inserts !! Interesting product, glad you reviewed it. Might buy some now. very unique set and love the cool inserts! +It's great to have Champs back! A product much different than the other products. - Actually, I miss the colorful parallells a little. As long as they're not overproduced, that would've been a nice touch. Nice review like always and cards are nice. hmmmm Nice. Its nice to be here. Playing online is a fun on Bad IceCream 3 is real fun but going to coolmathgames is also good. When you will play on Pbs Kids Games for Kids you will like the games online on this website. run 2 is also famous online arcade game. Peppa Pig Peppa Pig is a famous character do you know about it. 2048 games is a tile puzzle games which you can enjoy.Bad Ice Cream 3 is funny games as well.